ANKARA - Turkey's EU minister, Volkan Bozkir, explained Sunday's police crackdown on senior media figures and police officers in 13 cities across Turkey to EU enlargement chief Johannes Hahn in a phone conversation late Monday. 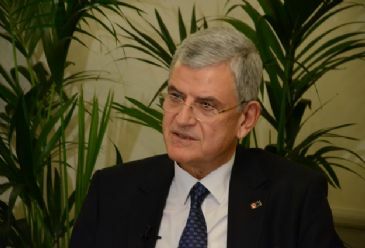 "Minister Bozkir mentioned to his counterpart that the judicial process was still ongoing, that the executive was not involved in this process in accordance with the principle of the separation of powers," a statement from the Turkish EU Ministry said. "Turkey is a country which observes the rule of law," Bozkir told Mr. Hahn according to the statement. “Everyone should respect the independence and impartiality of the judiciary." "Bozkir also stated that the detained persons were not investigated because of their written or oral expressions and also that the freedom of press in Turkey cannot be harmed," said the statement. An operation was launched Sunday in Istanbul and other provinces against people suspected of being affiliated with what the Turkish government describes as the "parallel state," an alleged group of bureaucrats embedded in the country's institutions, including the judiciary and the police. President Recep Tayyip Erdogan has slammed the European Union for its “impetuous” criticism of an ongoing operation, which has seen the arrests of high-profile media members and police officers in Turkey. Erdogan responded to comments by Federica Mogherini, the European Commission’s high representative for foreign affairs, and Johannes Hahn, commissioner for European neighborhood policy and enlargement policy, who described Sunday’s police crackdown in Turkey as going against European values. Turkey's president replied that the EU had no authority to meddle in the internal affairs of Turkey. EU foreign policy chief Federica Mogherini said she was "very surprised" by Erdogan’s reactions against the EU. She added that the EU path for Turkey was not so much about economic interest but about values and principles, starting with democracy and the rule of law.